I heard about Pack for a Purpose from a friend and decided to check it out as my husband and I would be in Namibia in December, 2012. Sure enough there was a drop off site near Windhoek so I asked my teacher friends if they had any supplies they would like to donate. We took 28 pounds worth of crayons, pencils, pens, children’s books, math supplies, games, etc. 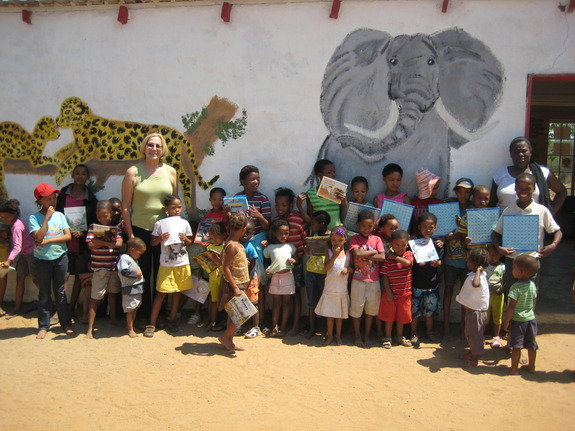 The day we arrived in Windhoek and delivered the supplies was the last day of school at the Naankuse Clever Cubs School. The children were excited and the teacher’s eyes were huge when she saw what we brought. The room was very colorfully decorated with children’s work and typical primary school items. I know the materials will be well used and it felt good to know we could make a difference!